You want healthy homemade meals, but don't want to sacrifice flavor or spend hours in the kitchen. You care about heart health and want to get your diabetes under control, but still want to enjoy eating. Where can you find easy-to-make recipes that are both nutritious and delicious--in The Heart-Smart Diabetes Kitchen: Fresh, Fast, and Flavorful Recipes Made with Canola Oil. Bring the taste of fresh, natural ingredients and wholesome meals to your table. Featuring 151 recipes made with canola oil—one of the healthiest cooking oils available—you will be serving dishes that are low in saturated fat and cholesterol but high in flavor in no time. It’s just what the doctor, and your inner chef, ordered. 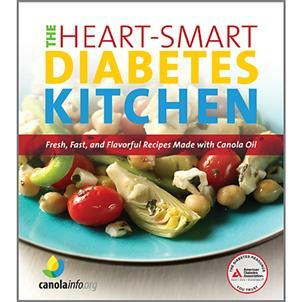 The Heart-Smart Diabetes Kitchen is brought to you by the American Diabetes Association® and Canola Info. ADA is the nation's leading volunteer health organization supporting diabetes research, information, advocacy, and publication of comprehensive diabetes information. CanolaInfo is a nonprofit information source about canola oil. For related information about the cookbook, go to www.heartsmartdiabetes.org. Really good recipes, BEAUTIFUL photos! Can't wait to cook! !